In it, Volkswagen are keen to show off various features on their cars. In this case, Energy-Absorbing Door Padding. To illustrate this exciting feature, they highlight one of the great irritations that motorists face in the urban environment, visible at just left of centre in the photo. How does the esteemed panel of readers feel about this photograph/campaign? It's clearly 'ignoring the bull' and placing responsibility on the vulnerable traffic user, no doubt about it. But does it piss anyone off or is it acceptable? Funny, if this happened in Denmark or Holland, the motorist would be at fault if a collison occured. 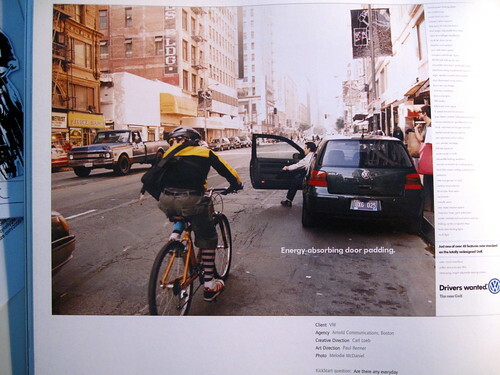 Then again, the cyclist would have been provided with safe urban mobility on wide, separated bicycle infrastructure intelligently placed to the right of the car, with ample room for a door zone.